"You always deliver what you promised and in a timely manner. I appreciate the e-mails that keep me informed of the progress of my order. Thanks again." How inert coatings improve sulfur analysis. An inert flow path will prevent adsorption, contamination and loss of active and reactive compounds like H2S, mercaptan, and other sulfur species. Our SilcoNert 2000 coating offers superior sulfur inertness and near 100% recovery, even at extreme part-per-billion detection limits or after 7 days of storage; making sulfur testing reliable even in downhole and field testing applications. 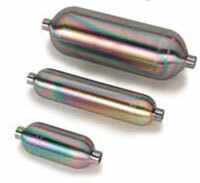 Reactive uncoated stainless steel sample cylinders adsorb all the H2S sample after a day. Need a high durability inert coating? Our Dursan coating is ideal for field and downhole sampling. Uncoated active stainless steel or glass surfaces result in slow response, costly rework, and process failures. SilcoTek® coatings give analysts confidence in the reliability of results. Even under extreme conditions found in refinery, flare and downhole environments; SilcoTek coatings significantly improve sample response and reliability. Get more information about how SilcoTek® coatings improve H2S analysis and sulfur sampling. Read our coating selection guide or download our inert coatings presentation. Or see for yourself, watch our inert coatings video and learn how our coatings improve sulfur sampling.